When the world marked the fifteenth anniversary of the attack on the World Trade Centre on September 11, 2001, one in three of us had no memory of that calamitous event. We hadn’t yet been born or were but infants, a reminder of how quickly the onrush of time turns today’s reality into past. Many great war novels have been written since Leo Tolstoy’s War and Peace was published in 1869. Of books on the First World War, I consider Boris Pasternak’s Dr. Zhivago the most profound, most emotionally powerful, and the best documented fictional account of that conflict and how it brought suffering to the lives of millions of Pasternak’s countrymen. The sentiments of the novel were captured faithfully and authentically in the movie starring Julia Christie and Omar Sharif. 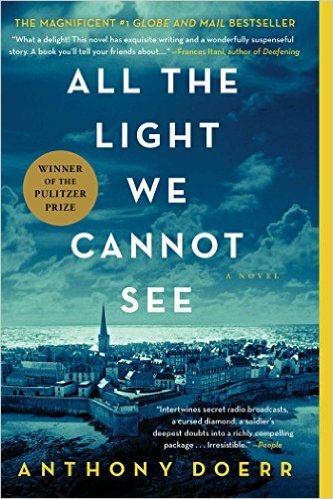 Now, All the Light We Cannot See, winner of the 2015 Pulitzer Prize, presents a beguiling, unforgettable chronicle of a Second World War love that comes to match anything of which Pasternak wrote, yet leaves us mysteriously both curious and satisfied as to the way human fortunes turn on the unpredictable, and how fate unknowingly bestows its inevitable outcome on each of us. More than 25,000 reviews of this book have been posted to Amazon. Nearly all are enthusiastically favourable. The book tells the story — entirely in the present tense — of a German boy recruited into the Hitler Youth, a French blind girl whose father is given the responsibility to save a precious jewel from the Nazis, and a heartless pursuer of all three, a man as corrupted in spirit as his body is by disease. How their fates lock together in the legendary French coastal outpost of Saint-Malo, and the paths that some of their lives take after the war, provide a gripping plot through to the last of the book’s 532 pages. Its last chapter is set in what for me is a familiar site — the Jardin des Plantes in left bank Paris. The heroine, Marie-Laure LeBlanc, walks the path that winds to the top of a hill and a gazebo that stands there. I recall walking that very path on a pleasant October morning. All the Light We Cannot See is more, of course, than the story of its central characters. It is a dissertation on time and a meditation on the unseen light that fills the universe in the form of electromagnetic waves and other forms. It is also an essay on the control of the human spirit, and a warning for our age that it is not so difficult to warp and bend society into directions that can lead only to catastrophe. In this novel Anthony Doerr gives us some of the most original writing of our time, and a work that will be memorialized long into the future.